A new electrochemical magnetoimmunosensor (EMIS) has been developed for the screening of residues of sulfonamide antimicrobials in honey samples. The immunosensor is able to detect up to ten different sulfonamide congeners at levels below the action points established in some European countries (25 μg kg−1) after a hydrolysis step in which the sulfonamides are released from the corresponding conjugates formed in samples of this type. In spite of the complexity of the sample after the hydrolysis procedure, the EMIS could perform quantitative measurements, directly in these samples, without any additional sample cleanup or extraction step. For example, sulfapyridine, used as a reference, can be detected in hydrolyzed honey with a limit of detection (IC90) of 0.1 ± 0.03 μg kg−1. Considering that the use of antibiotics for bee treatment is prohibited in the European Union, the immunosensor presented here could be an excellent screening tool. Moreover, several samples can be processed in parallel, which facilitates the analysis, reducing the necessity to use more costly confirmatory methods for just screening. 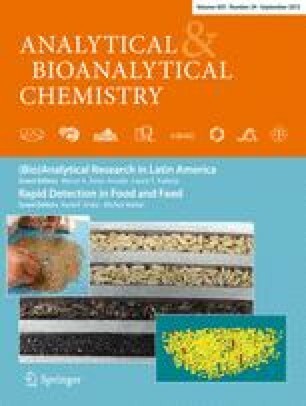 As a proof of concept, a set of blind honey samples (spiked and incurred) were analyzed and the results were compared with those obtained by high-performance liquid chromatography–tandem mass spectrometry, demonstrating the potential of the EMIS as a screening tool. This work was performed in the frame of European project Conffidence (KBBE-211326). The AMR group (nowadays the Nb4D group) is a consolidated research group (Grup de Recerca) of the Generalitat de Catalunya and has support from the Departament d’Universitats, Recerca I Societat de la informació la Generalitat de Catalunya (expedient 2009 SGR 13432). CIBER-BBN is an initiative funded by the VI National R&D&I Plan 2008–2011, IniciativaIngenio 2010, Consolider Program, CIBER Actions and is financed by the Instituto de Salud Carlos III with assistance from the European Regional Development Foundation.